Pinot Gris has at least another nine aliases which gives some indication of the world-wide popularity of this grape and, maybe, its adaptability to differing conditions. There is a huge range in the quality of wines it produces, from the insipid tasting Pinot Grigio to, for instance, the intensity of an Alsace vendage-tardive. There seems to be a consensus that Alsace produces the most interesting wines from this grape, no doubt helped by low yields and the long, dry autumns which enable full maturation of, and flavours in, the grapes. 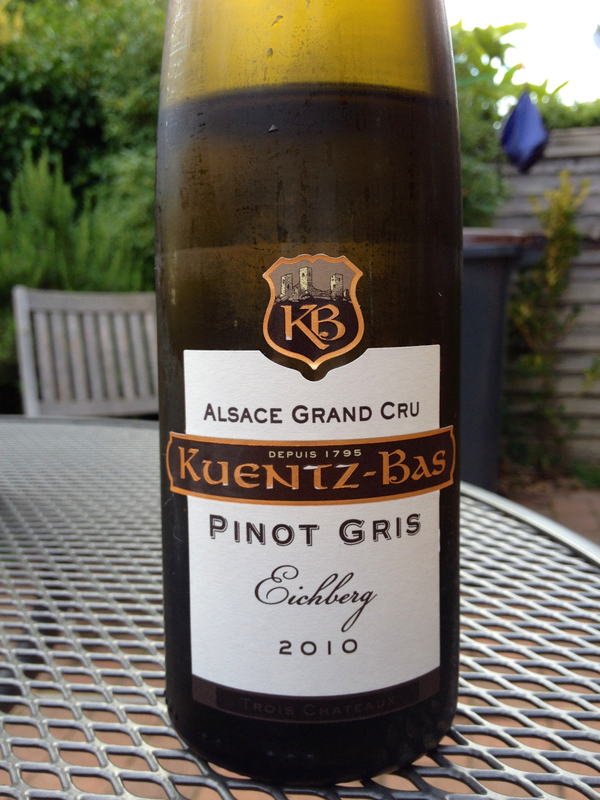 The wine we tried was Kuentz-Bas Grand Cru Eichberg 2010 (ABV 14%). It cost £22 (WS). The vineyard’s area is just south of Colmar, in Eguisheim, and benefits from very low rainfall in normal years; in the ‘heatwave’ 2010 vintage the wines produced were expected to be of great longevity and very delicate. And so this proved. The wine had rich lemon yellow colour with no hint of green, suggesting fully ripe grapes. This was detected on the nose, which was a fruit-bowl of smells – very ripe gooseberry, rich rhubarb, raisins – all at maximum maturity. Lovely. The initial hit was sweet but then, through a smooth, weighty mouth-feel, developed a long dry finish. It was a beautifully made and balanced wine. The wines produced from this grape variety are wonderfully attractive – just avoid the cheap northern Italian versions. However, there are some excellent Pinot Grigios from that region, you just have to be prepared to pay a little more them. The Condrieu we tasted this evening was a powerful wine. We realised this when we started to struggle over the crossword after completing half of it at a good lick. Suddenly, the fine decoding of cryptic clues seemed laboured. So, we gave up and devoted the next twenty minutes to just enjoying the wine. 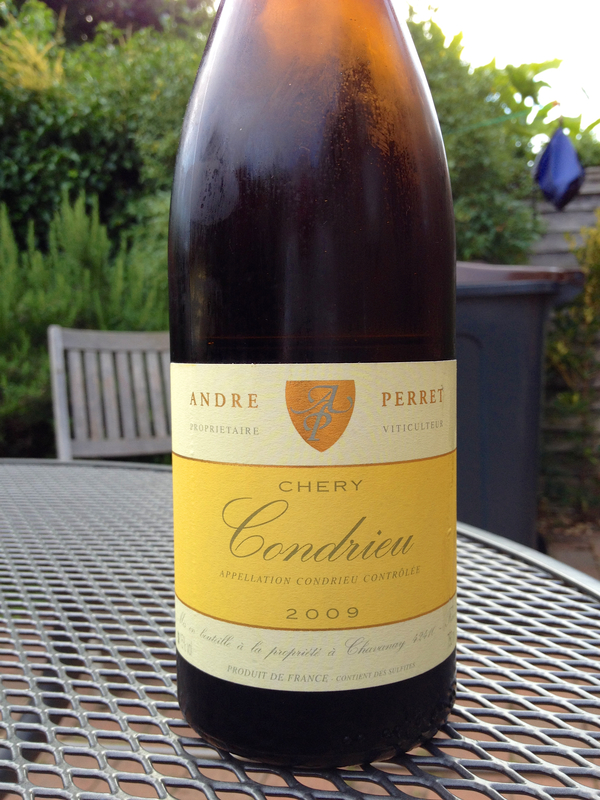 Richard had bought this 2009 Condrieu (Coteau de Chery Dom Andre Perret) en primeur from the Wine Society as a case of three wines for approximately £30 each. [Richard: think I asked for 6 but demand was high as 2009 was trumpeted as a great vintage]. The colour was a strong lemon-yellow with a very slight green tinge, clear and very bright. The nose was so slight as to confuse my guessing the region and grape variety but it did open up slightly in the glass. This dumbness of the nose is interesting as the Viognier grape is usually more assertively perfumed, this most certainly wasn’t. However, the palate was very complex. Words such as full, rich, oily, voluptuous were all bandied about and it still had a slight welcome acidity to keep us interested in another sip. Both of us agreed on its incredible length, the flavours just kept on coming. We did not notice the ABV at first but did recognise a certain heat at the end – evidence of the alcohol which the label proclaimed at 15%. No wonder the crossword suddenly got difficult. This was a wine to respect, a lovely glass that could be enjoyed solo but not one to swig back. 2009 has been described as a ‘sun-drenched vintage’ in the Rhone, producing red wines that could be laid down for some years. We didn’t think that this white wine would improve much more and at five years old was at its peak. Reference books state a four year maximum drinking window, after that the wines start fading. This was not fading – but we would have, had we drunk more. 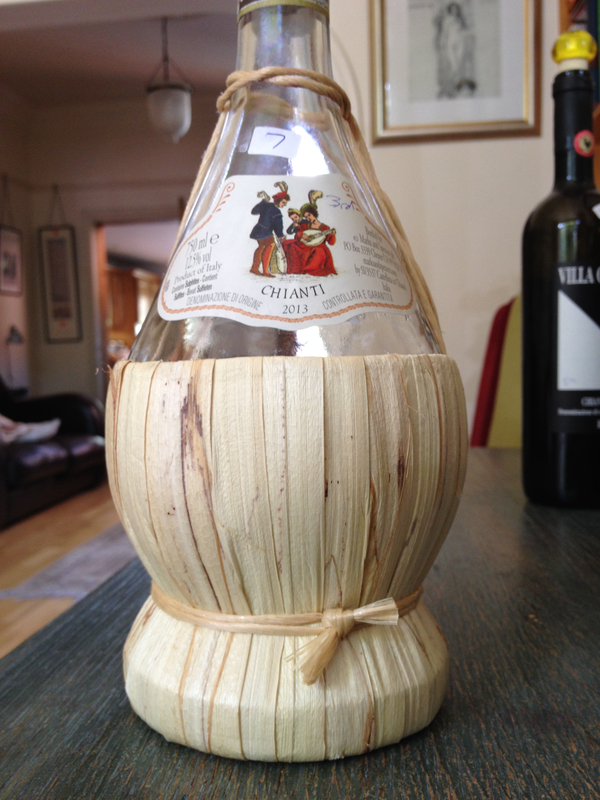 A small group of us recently (5th July) held a blind tasting of Chianti wines. We undertake these ‘wine trials’ on a regular basis and with varied themes, so, although only keen amateurs, we have some experience in tasting blind. It is an interesting and enjoyable way to spend an evening. The Chianti tasting, in many ways, proved to be the most interesting – not least because of the huge variation in quality and the random nature of the wines’ value for money. Out of seven wines tried, we all agreed that two stood way above the rest in terms of quality. One wine was left way behind whilst four others jostled for a rather poor midway position. This split was the most distinctive we’ve ever had in two years. This dramatically contrasted with the two best wines. 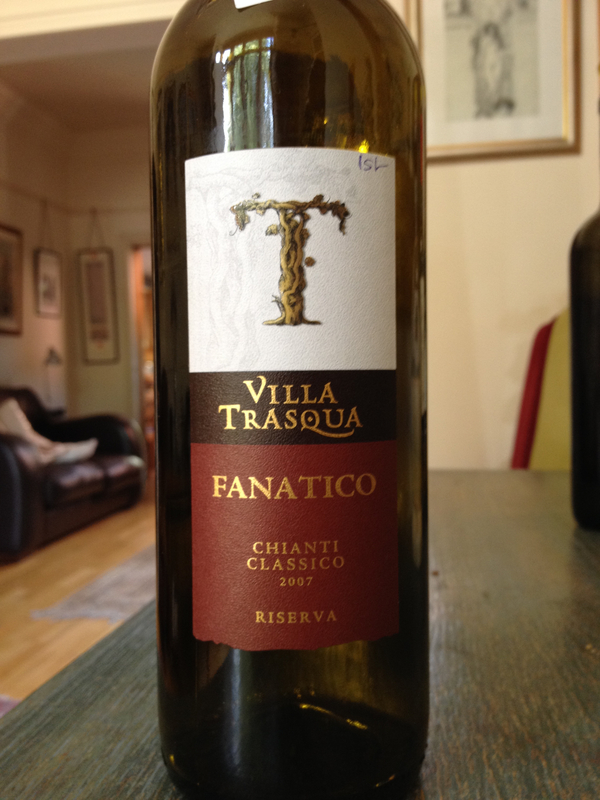 In our opinions, Villa Trasqua ’07 Classico Riserva (sold by Haslemere Wines) and Fontodi Classico ’07 (Wine Society), were the winners. 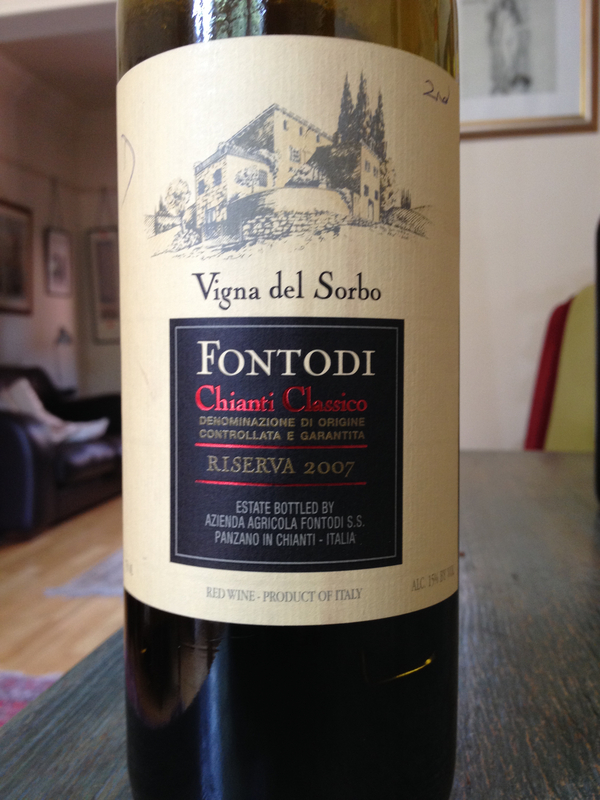 My notes have them both with long, dry finishes following the initial tart cherry hit, so typical of Chianti. Their prices were £18 and £30 respectively – and at odds with their positions. This suggests that, with Chianti, you broadly get what you pay for, however other results were more random. 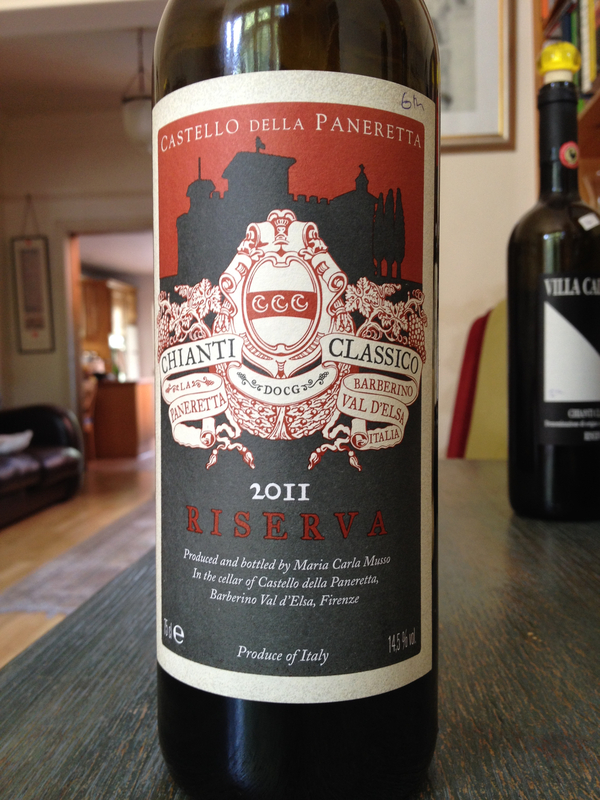 M & S had two wines in the middle ground but the lively, young £10 raffia-flasked plain ’13 beat the powerless £14 Paneretta Classico Riserva ’11 – both wines being rather short. 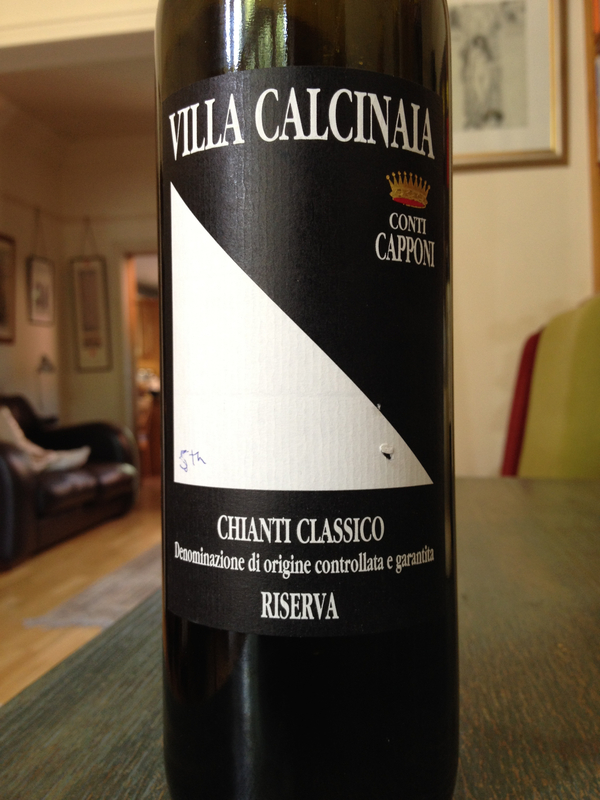 The £23 Classico Riserva from Capponi (sold by Berry Brothers and Rudd) was not good value, being rather hot in the mouth (14% ABV) and seeming unbalanced. 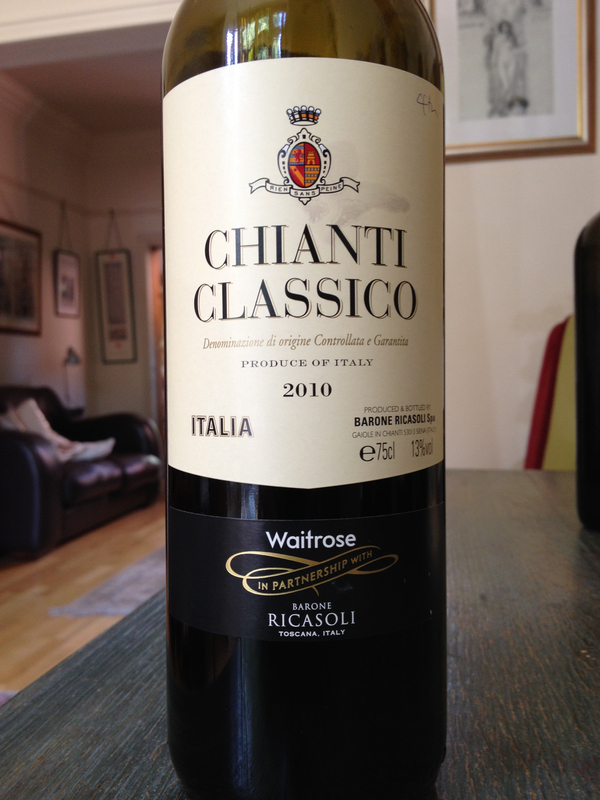 Finally, in the middle ground came Waitrose’s ’10 Ricasoli Classico, initially smooth but lacking in oomph at the finish, priced at £13. 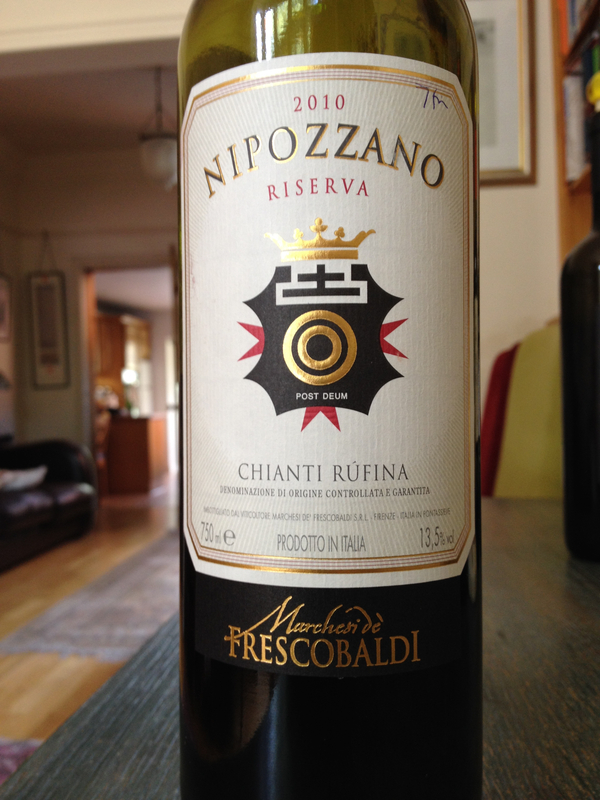 As for a general comment, Chianti does not seem to offer any certainty to the buyer. Prices, labels, regions and even vintages do not give many signposts as to the quality of wine behind the label. That’s frustrating for the public, interesting for us and expensive for all. Riesling, a German grape variety, a noble grape, a grape that succeeds in many places – including South America. Okay, you’ve spotted the thinly disguised World footie theme – but we drank this earlier on Sunday evening, before the final. How prescient are we? 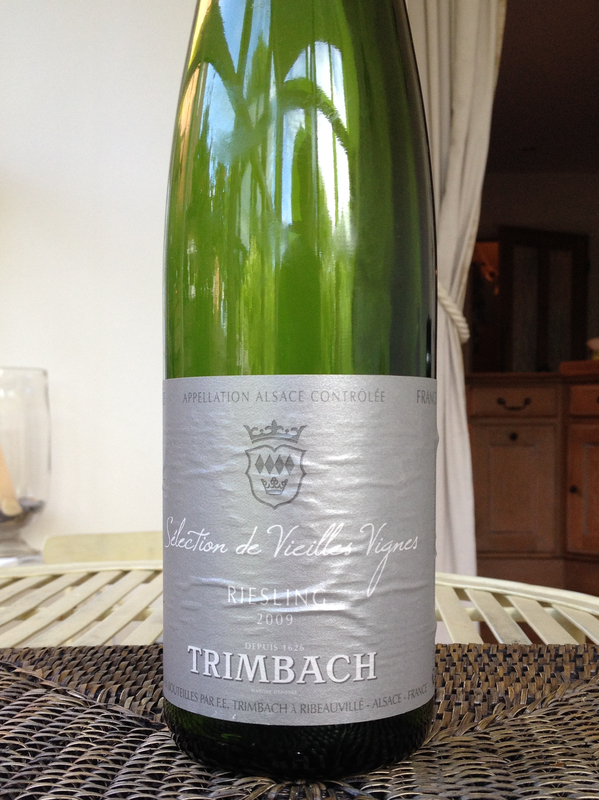 This is Trimbach’s Selection de Vieilles Vignes Riesling 2009 (ABV 13.5%), a French wine made from a German grape. Richard seemed to remember that previous ones tried were slightly off-dry and we expected, because of the pedigree, that this would be similar. The colour was pale green rather than pale lemon, indicating the presence of youth and acidity. It was beautifully clear. On the nose it was rich but subtle, very restrained but with the slight kerosene whiff that Riesling gives when older. But the aromas were not strong and faded quite quickly. A wee bit disappointing, we had to admit. The palate had a regal restraint, a power that was born of the weighty mouth feel and richness. The pronounced acidity was that of lime, which helped balance the richness and led us on to another glass – but then no more. A lovely food wine, great with deep flavoured, oily dishes. It was crying out for smoked salmon or even a quiche Lorraine. As for being off-dry? Not a bit of it. This was bone dry – “all the sugars aged out” (Richard). German grape, French expression – here’s to the Europeans! Chardonnay is the second most popular white wine grape in the world. It is a brand that is as well-known as Coca Cola, Adidas and Nike. 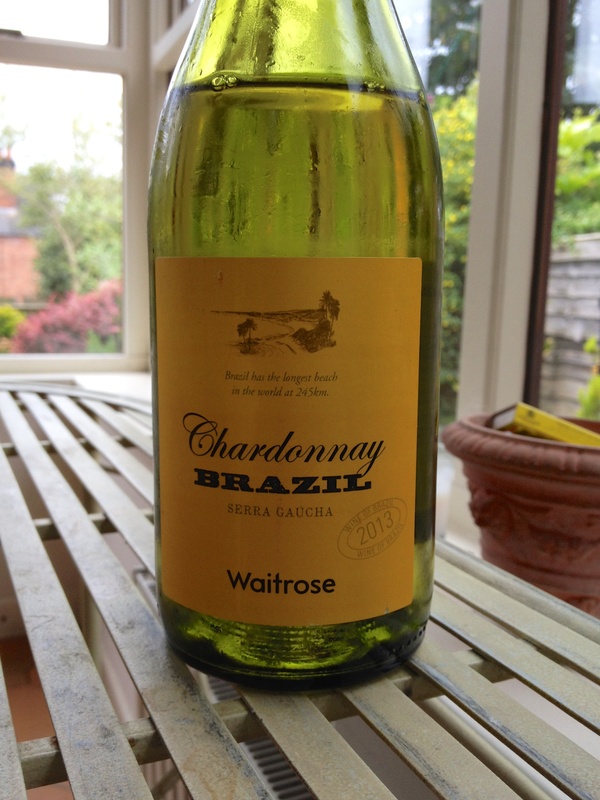 Therefore it makes sense that Waitrose linked Chardonnay to the series of football games taking place in Brazil at the moment. Brazilian Chardonnay, the bright yellow label shouts, was reduced from nearly £10 to about £7. Therefore, we had to try our first Brazilian wine; for Richard this was a blind tasting. We tasted it alongside a Chardonnay from a more traditional region – the Cote Chalonnais, (this had been opened 24 hours previously). The wines were similar in colour, both pale lemon with a very slight green tinge. The French wine had a pungent and, initially, not very pleasant nose which later faded. It smelt of ripe grapefruit. The World Cup wine’s nose was rather like England’s performance – not very fruitful, but there was a slight hint of lime which was quite attractive. Reserved, I’d call it. The Brazilian’s palate was rich, dry and resonant of white stone fruits but with a nutty edge. It had an almond-like, mineral finish that gave it some character. It was, as Richard said, “anything but Chardonnay”. The French’s palate was a more traditional rich honey in flavour, softer and more subtle. We both agreed that the Brazilian wine was interesting but lacking in subtlety and, rather football-like, you’d get tired of it after a time. The French offering improved, lost its unpleasantly pungent nose and, therefore, we gave it our nod. So, it won, but in extra time. For under £7 (on offer), the South American wine was great value. The two wines’ details are as follows: Brazilian Chardonnay Serra Gauche 2013 and Francois D’Allaines Bourgogne Cote Chalonnais 2010 (WS £10 but no longer available).